Error 0x80070490 is usually experienced when applying a system update through Windows Update or when updating an app downloaded from the Microsoft Store. The problem is also determined to appear when updating from Windows 7 and Windows 8.1 to Windows 10. Windows updates are essential for your computer system. You are most likely to obtain Error code 0x80070490 whenever you aim to update your PC or While Installing new Updates. Some services required by Windows Update are manually disabled. Corruption within the Registry files. 3rd-party Antivirus is creating a conflict that is preventing the update from installing. Press the Windows + R key on the keyboard. In the Run windows type “MSCONFIG“ and click Ok”. Navigate to “Run” dialogue box and type in “cmd” before clicking “OK”. Type “sfc/scannow” in the resultant command prompt. Find Windows Update, and click Run the troubleshooter. Open PC Settings and locate Accounts -> Other accounts. Select Add an account and add a new user account to your computer. Select the newly created account and click Edit. Change user type to Administrator on the Editor account step. Click OK.
Log on to this new account which has administrator privileges. All applications installed on your PC will be reinitialized and synchronized consistently. Keep this account logged in and switch it to the original account from Start Screen. Now you are in the original account again and try to install updates or apps that reported error. Press Win + R to open a Run command. Type rstrui.exe and hit Enter to open System Restore. Hit Next in the first window and then check the box next to Show more restore points. 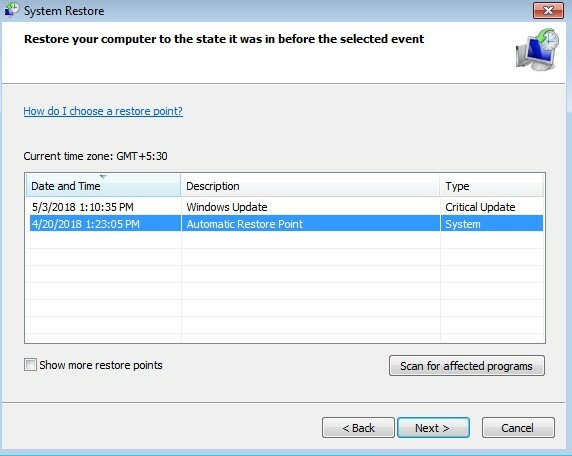 Select a restore point prior to when the application started malfunctioning and click the Next button. Hit Finish then click Yes at the next prompt to begin the restore process. When the restore is finished, your PC will automatically reboot. Upon the reboot, your OS will be restored to the previously selected version and the error 0x80070490 must be eliminated.